Did you suffer serious injuries or was your loved one killed in a motorcycle crash in Alabama? You might be entitled to compensation for the damages you have suffered, including medical expenses, lost wages, and property damage. You will want to contact an attorney as soon as possible. Motorcyclists are by nature far more vulnerable on the road than drivers and passengers in cars, trucks, and SUVs. Operating a motorcycle is complicated and requires an extreme amount of focus. Deciding when to swerve or brake could be the difference between life and death for a motorcycle rider. Every driver on the road has a duty to operate their vehicle with caution to ensure the safety of all other drivers, passengers, and pedestrians on the road around them, including motorcyclists. Drivers who are intoxicated, distracted, or are otherwise acting irresponsibly are especially dangerous for motorcyclists. When motorcycle-involved accidents do occur, it is incredibly rare for the motorcyclists to walk away complete unscathed. The injuries they suffer, including severe brain, spine, and limb injuries, tend to be significantly more serious than the injuries sustained by drivers and passengers in vehicles who are afforded the safety features of car, truck, and SUV cabins. This ultimately means motorcycle riders and passengers who are injured in accidents often require expensive, invasive treatments and lengthy rehabilitation, during which time they likely won’t be able to work or make a living. Their injuries may even prevent them from ever returning to their field of employment. The severe financial consequences for motorcyclists makes it incredibly important they are able to collect adequate compensation following their accident. If you have been injured or a loved one has been injured or killed in a motorcycle accident, it’s likely in your best interest to contact experienced Birmingham motorcycle injury attorneys who are ready to fight for the compensation you deserve and advocate on your behalf. Many motorcycle crash victims forgo hiring an attorney under the belief that doing so will allow them to keep more of whatever money they are awarded. In actuality, insurers are usually even less inclined to offer people without legal representation adequate settlements, and most settlement offers are woefully short of what victims are actually entitled. Worse yet, without a lawyer, you may very well have to deal with an insurance company refusing to compensate you at all and possibly arguing that your injuries were actually your own fault. Farris, Riley & Pitt, LLP understands these types of tactics and is capable of protecting your rights and fighting for a fair and full settlement. When you hire our firm, our lawyers will diligently work to make sure that you get every last dime of compensation you are entitled to. Many settlements offered by insurance companies are based only on existing bills, but Farris, Riley & Pitt, LLP can negotiate a settlement that includes all of your expected future expenses as well. Our firm can handle all of the paperwork, phone calls from insurers, and negotiations so you can focus on your recovery. You also do not need to worry about paying us any fees unless you get a monetary award. The attorneys of Farris, Riley & Pitt, LLP have more than 100 years of combined experience handling all kinds of personal injury claims. We understand the significant challenges that motorcycle accident victims face on their recovery and do what we can to help these people get justice. Our firm has secured multiple verdicts and settlements in excess of $1 million. We approach each case with the goal of helping victims recover as much money as possible. Farris, Riley & Pitt, LLP can handle all negotiations with insurance companies on your behalf to try to achieve the best possible settlement. When an insurer refuses to provide adequate compensation, we will not hesitate to file a lawsuit. Our firm takes pride in our dedication and commitment to every case we handle. We will work closely with you and keep you fully updated on the progress of your case. While every motorcycle crash is different, many accidents often share common causes. Farris, Riley & Pitt, LLP is familiar with the many different reasons these crashes happen and can conduct an independent investigation to secure the necessary evidence and prove the negligence of another party. Left Turn Accidents — One of the most common types of crashes occurs when a driver turns left in front of an oncoming motorcycle. Whether this occurs because of impatience or a simple failure to see the motorcycle, a motorcyclist traveling at full speed is typically powerless to avoid a collision. The impact alone can cause serious injuries, but additional harm could result if the motorcyclist is thrown from their bike. Lane Change Accidents — When motorcycles are traveling in the same direction as passenger vehicles, drivers may cause these types of crashes when they fail to perform a basic “shoulder check” of their blind spot. Additionally, these kinds of accidents also occur when motorists attempt to change lanes and a motorcyclist is lane splitting — riding the motorcycle between lanes of slow moving or stopped traffic. Failure to Obey Traffic Signs or Signals — Many collisions at intersections involve passenger vehicle drivers not stopping at red lights or stop signs. Violations of other traffic signs or signals can also cause these types of wrecks, which typically result in severe injuries for the motorcyclist. Rear-End Accidents — While a passenger vehicle striking the rear bumper of another passenger vehicle usually results in little more than minor property damage, the consequences can be much more serious when the vehicle struck is a motorcycle. Even at low speeds, a rear-end collision frequently has enough impact to throw the motorcyclist several feet from their bike. Driving Under the Influence — Drunk driving is a criminal offense in Alabama, and a motorist operating under the influence of alcohol or drugs is much more likely to make any one of a number of poor decisions that causes a wreck. Keep in mind that a criminal case is completely separate from a civil action. That means that a driver who is acquitted of DUI can still be held liable for damages in the civil case. If the driver is convicted, the conviction can be used as evidence of negligence in the civil action and could result in punitive damages possibly being awarded. Speeding — Any driver who is operating in excess of posted speed limits is less capable of controlling their vehicle in certain situations. Not only does a speeding driver lack the necessary stopping distance, but in some cases, speeding often leads to a loss of control that can also cause collisions. Reckless Driving — Alabama Code § 32-5A-190 establishes that a person commits the offense of reckless driving if they drive a vehicle “carelessly and heedlessly in willful or wanton disregard for the rights or safety of persons or property, or without due caution and circumspection and at a speed or in a manner so as to endanger or be likely to endanger any person or property.” Much like DUI offenses, convictions can be used as evidence of negligence in civil actions. Some motorcycle accidents do not involve other motor vehicles. If such a crash is the result of a defective motorcycle part or improper repairs, then the part manufacturer or maintenance company, respectively, could be potentially liable for the victim’s injuries. In some cases, governmental entities may also be liable for dangerous roadways when they were defectively designed or contained certain hazards that should have been corrected. Contributory negligence is a frequently utilized affirmative defense in many motorcycle accident cases. Under this rule, any negligence on the part of the victim that proximately contributes to their injury (even just 1 percent as compared to the negligent party’s 99 percent of fault) will bar the victim from recovery. Insurance companies will try to trick victims into admitting some degree of fault in relation to their crashes, which is exactly why you should never speak to an insurer until you have legal representation. Will I be able to recover damages if I was not wearing a helmet? Probably not, unfortunately. Alabama Code § 32-5A-245 states that no person can operate a motorcycle unless they are wearing a helmet that complies with standards established under Alabama Code § 32-12-41. The same statute also requires motorcyclists to wear shoes. Failure to wear a helmet inevitably leads to a contributory negligence defense (see above). The helmet law, however, does not apply to a person riding within an enclosed cab. How long do I have to take legal action for a motorcycle accident? Under Alabama Code § 6-2-38, the statute of limitations on all injury claims is only two years. Wrongful death claims are subject to this same limit. Though this may sound like a good amount of time, remember that it is important to take action as quickly as possible because your lawyer will need to conduct an investigation before attempting to negotiate with the negligent party’s insurance company. The Alabama Department of Transportation reported that there were 1,828 motorcyclists involved in crashes in the state in 2016. These crashes resulted in 1,297 injuries and 114 fatalities. According to the Governors Highway Safety Association, motorcyclists accounted for 8 percent of all motor vehicle deaths in Alabama in 2014. The state was one of only six in the nation to have a figure of fewer than 10 percent. The National Highway Traffic Safety Administration reported that motorcyclist deaths increased by 5.1 percent in 2016. The 5,286 fatalities reported accounted for the largest number of motorcyclist deaths since 2008. According to the Insurance Information Institute, the 606 motorcyclists killed (23.7 percent) between the hours of 3 p.m. and 6 p.m. were the highest number of weekday fatalities, but the most motorcyclist deaths on weekends occurred between the hours of 6 p.m. and 9 p.m. (595 or 24.6 percent). Those same timeframes also held true for motorcyclist injuries, with 14,000 injuries (27.5 percent) occurring between 3 p.m. and 6 p.m. on weekdays and 11,000 injuries (28.3 percent) occurring between 6 p.m. and 9 p.m. on weekends. Farris, Riley & Pitt, LLP has been helping injury victims all over Alabama for more than 20 years. 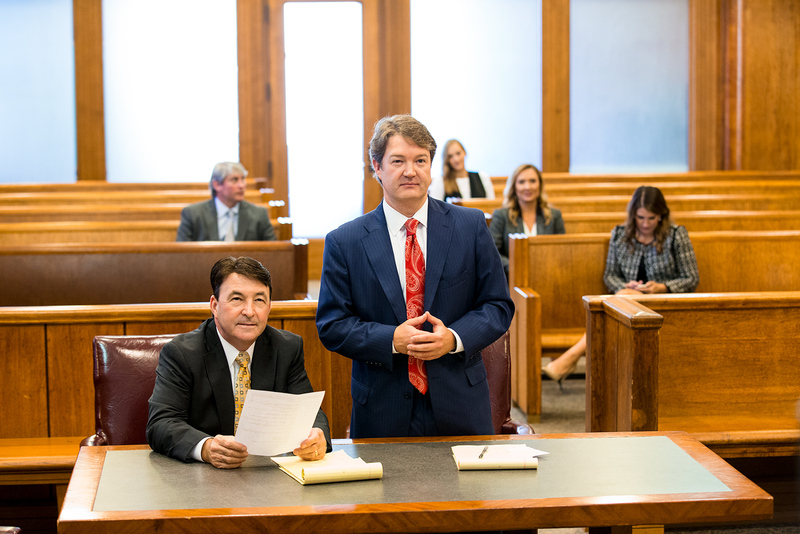 Our Birmingham law firm will maintain a commitment to helping you obtain all of the compensation you need and deserve. If you suffered catastrophic injuries or your loved one was killed in a motorcycle accident in the greater Birmingham area, you should not delay in contacting Farris, Riley & Pitt, LLP. Call (205) 324-1212 or contact us online to have our lawyers review your case and discuss all of your legal options during a free consultation.